Halloween is the only time you're allowed to be rude after someone has given you a gift. On Christmas, you have to grateful to your tube-sock-giving grandmother, but if someone hands you raisins on Halloween, you're legally allowed to slash their tires. Well, not legally. But it's socially acceptable. This year, though, you don't have to take revenge. Instead, you can just get better candy. Reese's will now take your dumb Halloween candy, and give you candy you actually want -- namely, a Reese's Peanut Butter Cup, which topped our list of the best Halloween candy. This will be accomplished via a special vending machine designed just for this exchange. Delish reports that the machine made its debut at the Tarrytown Annual Halloween Parade this weekend, but it's now headed for New York. If you're located in the Big Caramel Apple, head to Fifth Avenue between Washington Square North and East 8th Street between 4pm and 9pm on Wednesday to get sweet, sweet restitution. 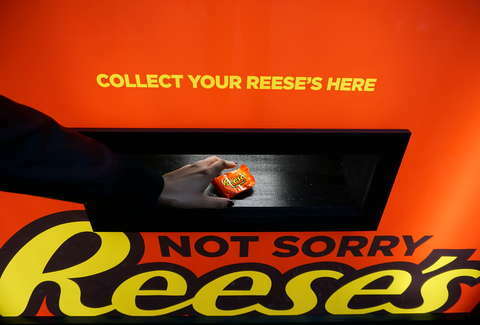 All told, Reeses's will be exchanging up to 10,000 cups. While this seems like an OK solution, it might be better to take a tip from High Point, Carolina and just ban bad Halloween candy.